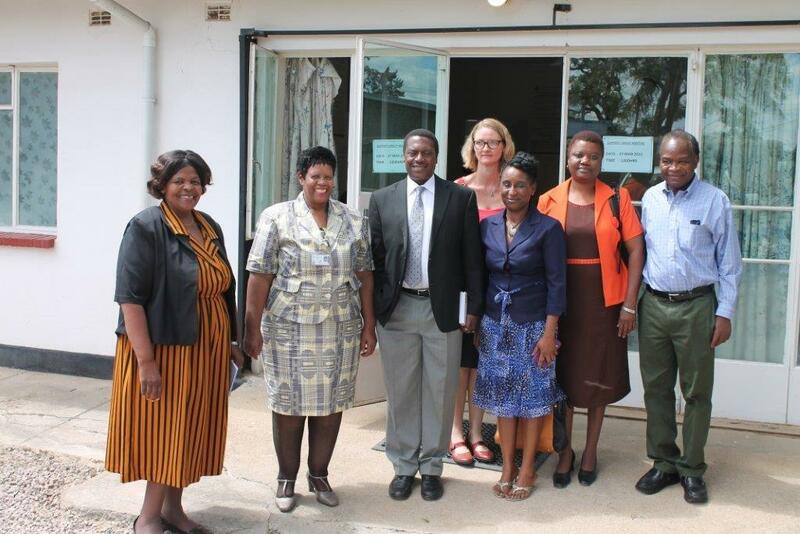 University of Zimbabwe Pro Vice Chancellor (Academic), Professor Chipo Dyanda toured 5 UZCHS-CTRC Clinical Research sites (CRSs) on 12/March/2015 to familiarise herself with the research activities and infrastructure established to support these activities. The 5 CRSs are Spilhaus, St Mary’s, Zengeza, Seke South and Seke North. UZCHS-CTRC Executive Director, Professor Z Mike Chirenje led the delegation that welcomed the Pro Vice Chancellor and took her to these sites. Highlights of her tour included a visit to the recently established Bio Safety Level 3 clean room at Spilhaus, which is to be used for preparation of the long term injectable TMC278LA (Rilpivirine) for the upcoming HPTN076 study: A safety and acceptability study of an injectable anti retro-viral product TMC278LA (Rilpivirine). At Seke South CRS, the Pro Vice Chancellor toured the recently renovated building at the site to which 8 rooms, dedicated to HIV Vaccines Trial Network (HVTN) work, have been added. These 8 rooms comprise: an HVTN preparation room; HVTN satellite laboratory fitted with Biosafety cabinet class II; an on-site pharmacy fitted with Biosafety cabinet class III; and data storage rooms, a meeting room and offices. Professor Dyanda was particularly impressed with the scope of work being conducted at the Clinical Research Sites, especially the fact that these activities are being led by University of Zimbabwe College of Health Sciences faculty supported well trained staff, the majority of whom are University of Zimbabwe graduates. The PVC hailed cordial and synegestic relationships that exist between UZCHS-CTRC organization, local authorities and the community and large.